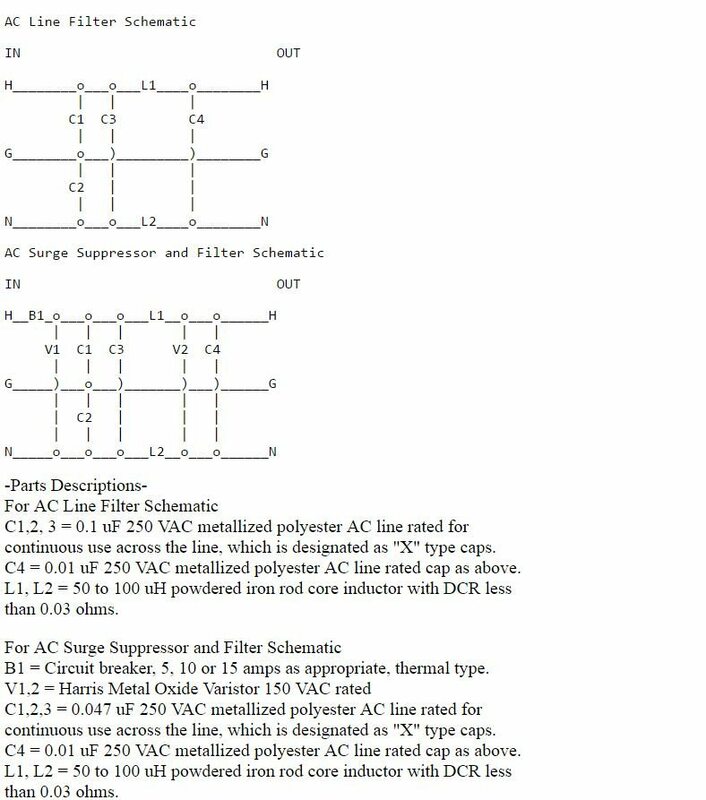 Attached is Jon Risch AC line filter circuit. This is a very well design low pass filter that will attenuate any conducted noise from 1MHz to 10 GHz effectively. you must choose a low series resistance inductor , minimum 0.03 Ohm and below. Please note for the capacitor voltage rating , try to choose 400 to 500V so you have margin of safety for the circuit. Wow it's been moons that Id seen this schema. Are you able to simulate it with a 100 watt loading ? It could be due to impedance mismatch, as when I simulated with higher filter output impedance to cause a impedance mismatch... the frequency response is no longer a smooth low pass filter response and have high overshoot at -3dB cut off frequency point. See frequency plot.... so you have to experiment and see whether the filter response is as simulated if you have instrument to measure it. Also you will notice that the filter phase change is very sharp at the cut off frequency point... this is not good for audio sound! the phase change should be gradually! Yes sure. Thanks for reminding me ! Here are some photos of the mentioned conditioner. You'll be able to customise the type of duplex receptacles used as well as the internal cabling. By default we are using the Furutech alpha-OCC cable/Neotech OCC/Western Electric. The balanced toroidal was customed made for us. Digital treatment was done for a single column of duplex receptacles, by doing so, this eliminated graininess and harshness of the digital domain, making the overall sound more analog. Attention was also paid to ensuring the toroidal is well damped from external vibrations. This was accomplished both internally and externally(well machined chassis). 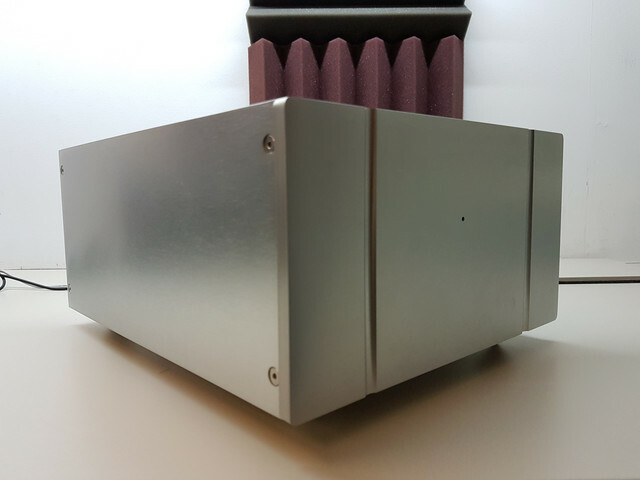 For the unit that will be used for comparisons, its fitted with dual furutech ncf receptacles, providing great sense of rhythm and dynamics. We welcome owners with power conditioners to have a go with this. It will definitely not disappoint. 9 one one 5 2 four 8 7. For more information on photos of various comparisons, do drop me a whatsapp message. You mean someone has made the Risch filter for sale ? I think what Lucas shown below is a balance transformer design with some noise filtering circuit and not Risch filter. as shown below....some built into IEC connector which is very convient. Of course all this can only use for low current application like CDP, DAC, pre-amp type..
Also the advantage of using common mode choke instead of two inductors have better common mode noise rejection. Tried those long ago JB. Didn't like what I heard. Another place that you can get powered iron core is amidon corp in USA that makes good quality products, also the cost of core is cheaper, may be have to pay higher postage fee. 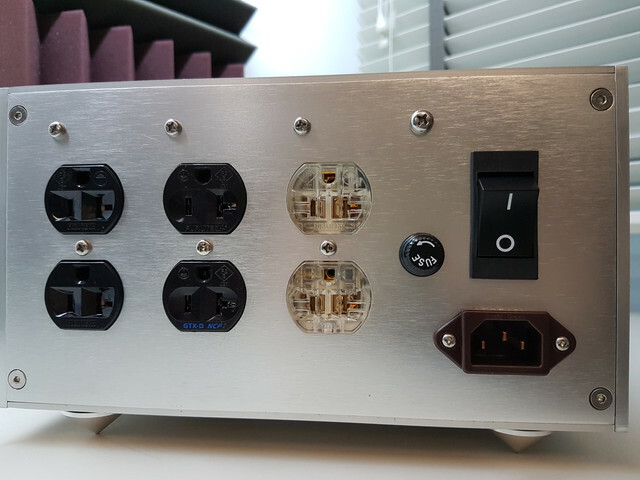 For switching power supply design - Hypex smps, I feel you will add more noise to the audio system. If you can think of all transistors and resistors has KTB noise, if you add more of this device to your system, the total system ham & noise spec of amp will be worst off.